Kaylee Darnell looks for an open teammate on Saturday evening against Fairland. 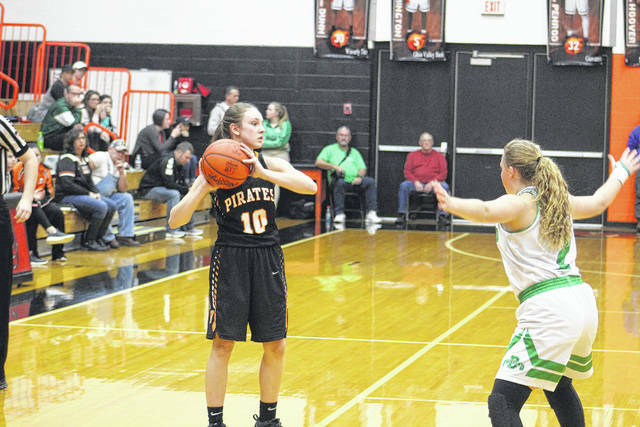 WAVERLY — Wheelersburg entered their game against Fairland on Saturday averaging 66 points per game in the opening two games of the tournament. The 16-4 Pirates looked impressive in the first couple rounds of play, but knew they would have their hands full with a 19-2 Dragons squad. Hanging around early, Wheelersburg would ultimately fall 61-34. In the first quarter, Wheelersburg hit three three-pointers from three different players to set the pace early. Abbie Kallner, Ellie Kallner, and Leann Spradlin all hit a three to help the offense of the Pirates play well early. Spradlin and Abbie Kallner had five points apiece after one, and Wheelersburg was tied with Fairland at 14 all. Fairland had four different players score in the first, led by seven points from Emily Chapman. Chapman would finish the game with an impressive 26 points. In the second quarter, Chapman continued to shine with nine points in the period. 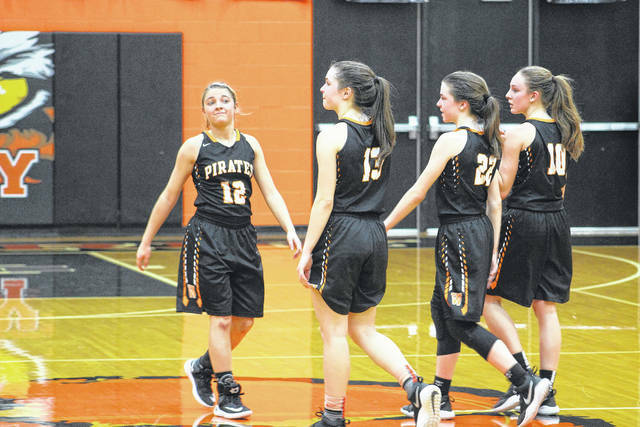 The Pirates, though, had the answer in Abbie Kallner who hit two threes in the quarter to keep Wheelersburg hanging around. Late in the period, Spradlin tied the game at 25 with a basket off an Ellie Ruby steal with 1:25 before the half. From there, the Dragons got a late push from their offense. First, Allie Marshall scored for Fairland on a steal. Then, Kelsie Warnock hit a triple for the Dragons right after. Not done yet, Fairland sank a shot at the buzzer from Chapman to take a 31-23 halftime lead. The Dragons closed out the half on a 10-2 run to take some momentum into the second half. Out of the break, Fairland would score six unanswered points before Kaylee Darnell was able to stop the run with a three. Wheelersburg would struggle to connect on some open looks in the latter part of the game. The Pirates would score just 11 points total in the second half, and were outscored 30-11 in the final two quarters by the Dragons. Wheelersburg missed all 10 of their free throw attempts in the second half, and shot just 2-for-16 on the game. “We weren’t good from the foul line, at all,” Spradlin said. Though the Pirates had some issues on offense late in the contest, they kept the fight coming on the defensive end and were able to fight until the bitter end. As the game ended 61-34 with a Wheelersburg loss, the careers of Ruby and Spradlin come to a close as well. Ruby will be remembered for her overall tenacity in the way she played for the Pirates. A relentless defender who was tough to get past, Ruby always gave her all when she was on the floor for Wheelersburg. Spradlin was a big part of the Pirates team in her career as well. An outstanding shooter who could stretch the floor offensively, Spradlin spent her final year with Wheelersburg working hard. The Pirates head coach will certainly miss having his two seniors from this season’s team around. The game was a lesson learned and a teaching opportunity for Spradlin. Spradlin has no doubts they will be a success given their work ethic they’ve shown over their careers. Looking ahead to next year, Wheelersburg has some pieces to build around. Abbie Kallner will be a senior next year, and Darnell and Ellie Kallner will return as sophomores. All three started for the Pirates against Fairland, and have been vital to the success of Wheelersburg throughout the season and will continue to be moving forward. Spradlin also cited sophomore Mallory Bergan as another player to watch if she can continue to develop as a player in the varsity game next year. Overall, Spradlin is optimistic about his team’s future.